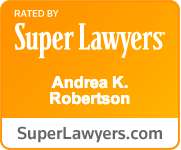 I would highly recommend Andy Robertson as a DUI defense attorney. Without having much experience with attorneys, I expected her to be merely someone who would represent me in the courtroom. However, I couldn’t have been more wrong. She was empathetic, understanding, and I really felt she was an advocate for me. In addition to those characteristics, I found Andy to be professional, thorough, and knowledgeable about the legal process and my rights. She was great at breaking down the legal jargon to something more understandable and really seemed to know the political nuances that come with each judge. Choosing Andy will provide some peace of mind to you during a likely stressful time.